Decorating and choosing the furnishing for our kitchen is not only about mulling over different kitchen cupboard designs and whether to buy a massive kitchen island or not. The actual key is to look for functionality in every detail, from the flooring tiles and making the most of the space to plumbing and electronics. 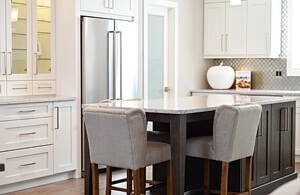 Luckily, there are plenty of kitchen manufacturers in Oxford to work with you in the kitchen floor plans to achieve the style you are looking for and advise you with kitchen decorating ideas. They are able to provide nice kitchens whatever your tastes are, either you want a wooden kitchen makeover by placing log furniture or the most modern kitchen. Counting on professionals to design your kitchen is the best bet if you count with little space. You shouldn’t forget what a kitchen is for and design shouldn’t ever be more important than functionality. Professionals will prepare small kitchen designs that make the most of the space available as well as meets your style tastes. Gray is the trendiest colour for your kitchen. Cabinets that are opened and closed by the touch of a bottom are now a thing. Mainly if space is a concerning. Black and white is always a good idea. Talking about colours, why not a green or red sink instead of the classic ones? Get to know more kitchen trends here. At Infoisinfo we always work hard to be able to offer you the most useful information so that you can easily find the best products and services for you or your company in Oxford. We know how happy your new home project makes you and we’d like to give you a hand with the kitchen. This room must be considered the heart of a home and we are sure that you will like to have one that you love. For this reason, we have prepared a list of the best kitchen manufacturers in Oxford for you to choose from whatever your preferences are, from small kitchen layouts to a luxury kitchen. Get in touch thanks to the contact details provided such as phone numbers, websites, address and opening times. In addition, you can have a look at comments and valuations from other clients to know how happy they are with their kitchen. We work in these areas: kitchen and ebook. Gazoob, wholesome content for children Developer of educational apps, ebooks and games. We also supply bathroom tiles. Powells Home Improvements Ltd or PHI (trading as Powell's Design) offer a kitchen and bathroom planning and design service including fitting and installation. Supplier of all building materials. Hire of power tools and large machinery. Kitchen and Bathroom showroom. All a builder could need. Bespoke cabinet & bookcases Fitted wardrobes & cupboards Flooring/skirting/door fascias Kitchens fitted Interior & exterior carpentry Loft conversions. Proffessional Tiling Company - We tile floors and walls - Bathrooms, kitchens, Commercial and Site work - All types of tiles from Mosaic to Natural Stones - Free Quotations.